Micaela McGibbon manages the registered Red Angus herd. 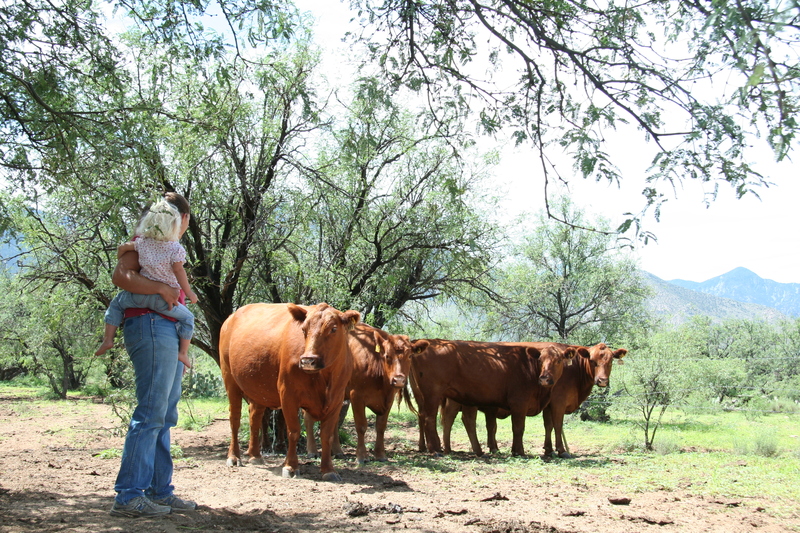 Seen here with her youngest daughter, Micaela stresses that Arizona beef producers provide a variety of niche markets for beef customers. Hungry for beef? Want it to be grass-fed? Arizona beef producers can accommodate you. In fact, a generational ranch family in southern Arizona can accommodate a variety of niche beef markets for that matter. 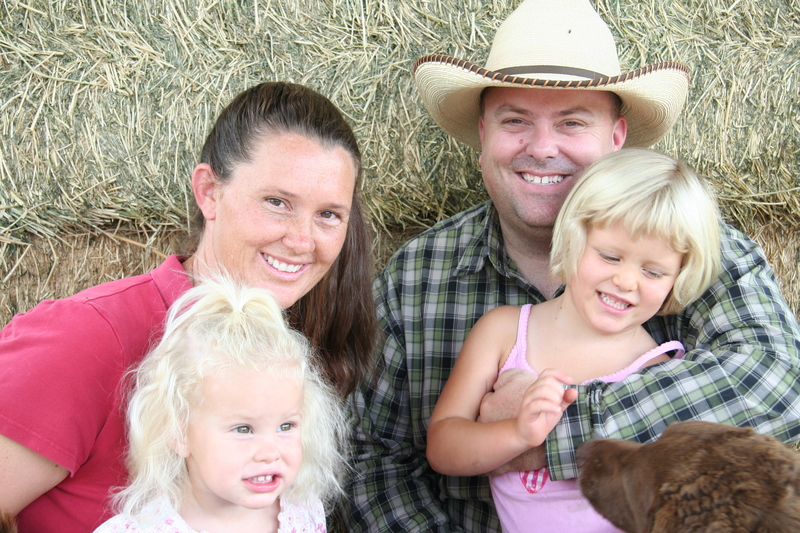 The McGibbon and King families run the ranches in Pima County that raise and sell grass-fed and natural beef. Their grass-fed beef is very low in total fat and extremely high in Omega 3 and CLA (conjugated linoleic acids). Tests have shown that their beef sold under the USDA approved label has up to 3 times the level of Omega 3s than are in natural salmon. In their other beef niche markets, their natural or organic corn-fed beef has very little, if any, fat within the beef and has a nice mild flavor. This beef is delicious and is grass-fed until approximately the last 60 days where it’s fed an all-natural diet including grass, corn, molasses and grains. Tests have shown that the Omega 3 levels in this beef are still up to 1.5 times the levels found in salmon. Their corn-fed beef can be more tender than grass-fed simply because it may have more fat within the beef. Demand for grass-fed ─ beef from cattle exclusively grazed on pastures and ranges, often qualifying as natural or organic product ─ is rapidly increasing in the U.S. and now makes up about three percent of the U.S. Beef market, according to Kenneth H. Mathews Jr. and Rachel J. Johnson at the United States Department of Agriculture’s Economic Research Services (ERS). Beef eaters looking for this niche and their beef can find it on www.fillyourplate.org. After selecting “Beef” in the search window look for “McGibbon King Ranches LLC” in the listing. Fill Your Plate has approximately 25 Arizona beef producers with a good number of them producing natural and/or grass-fed beef. You can also find out more about the McGibbon’s ranch by going to their Santa Rita Ranch web site. Drew’s grandfather started ranching in1970s in Arizona. Prior to that, grandfather McGibbon had a small farm in Illinois. “We got kicked out by civilization,” explains Drew. The McGibbon family love their ranching lifestyle. Drew and Micaela are raising their three daughters Izzy (not pictured) Cora and Tessa to value the traditions of family, faith and ranching. They also deliver to a 500-family co-op in Phoenix. The McGibbon-King Ranches sell beef by the box; each box is approximately 40lbs. The cost is $7.00 / lb. A typical box will include 12-plus pounds of hamburger in 1 pound packages, two packages of stew meat, one package of BBQ ribs, one package (with 2 steaks in each) Ribeye, T-bone, chuck-eye steak, flat iron, sirloin and other steaks, two roasts (suggest pot roast and shredded beef) and three round steaks, cut 1/2″ for carne Asada or stir fry. The content of each box will vary slightly but generally resemble the mentioned list. Discounts are available for sides of beef, approximately 160 pounds of beef. This entry was posted in Arizona farmers and ranchers, Beef and tagged Arizona farmers, beef production, local food, ranchers. Bookmark the permalink.